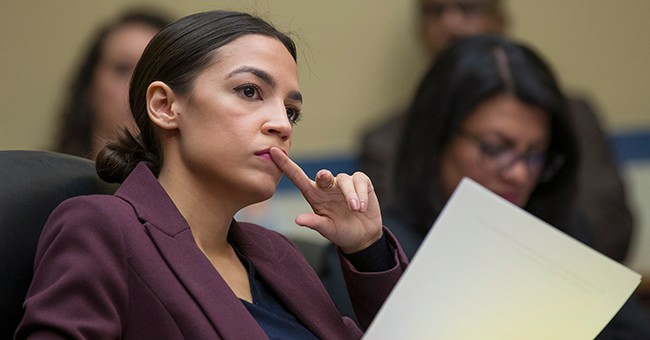 Senate Majority Leader Mitch McConnell (R-KY) followed through with his previous statements and forced a vote on Congresswoman Alexandria Ocasio-Cortez's (D-NY) Green New Deal. The legislation was a complete flop despite, with absolutely zero Democrats supporting the legislation. In fact, five Democrats – Sens. Doug Jones (AL), Kyrsten Sinema (AZ), Joe Machin (NY) and Angus King (ME) – voted with the Republicans in opposition to the Green New Deal. NEW: "Procedural vote on Green New Deal fails, as expected, with 57 "no" votes and 43 "present" votes. It's important to note that 2020 Democratic candidates Kamala Harris (CA), Cory Booker (NJ), Elizabeth Warren (MA) and Kirsten Gillibrand (NY) all previously endorsed the Green New Deal but voted "present." According to Sen. Manchin, he voted "no" because he wants "real solutions that recognized the role fossil fuels will continue to play." "We cannot successfully address our climate challenge by eliminating sources of energy that countries are committed to using," Manchin said in a statement. "Only through innovating and developing new technologies that reduce carbon emissions will we truly make a difference." Democrats, however, are calling McConnell's move a "stunt" that takes away from the larger climate change debate. I’ll be voting “present” on today’s #GreenNewDeal vote because we need real action on climate change—not this kind of sham vote. Combating this existential threat should not be treated like a game. Senate Minority Chuck Schumer shared Gillibrand's sentiments. "[McConnell's] stunt is backfiring and it’s becoming clearer and clearer to the American people that the Republican Party is way behind the times on clean energy and that Democrats are the party willing to take action," Schumer said. "... What's the Republican Party proposal? Is it more coal?" McConnell explained why he's against the Green New Deal. "The way to do this, consistent with American values and American capitalism is through technology and innovation," McConnell said, Fox News reported. " ... Not to shut down your economy, throw people out of work, make people reconstruct their homes, get out of their cars, you get the whole drift here. This is nonsense, and if you’re going to sign on to nonsense, you ought to have to vote for nonsense."